It's time to spend some time with family and friends! Umbrella Fountain for the little ones! The Purchase Pool Program is sponsored by the Purchase Community House and is made available on a membership basis. Everyone is eligible for a membership. The price structure sets one price at which everyone is eligible to join. Deductions are given for Purchase residents and participation in other PCH programs. Deductions are cumulative so if you are eligible for more than one, deduct each from your fee. Any family in the Purchase Elementary School District or with children who attend Purchase Elementary School is entitled to this deduction. Any family with a child who has an After School Membership during the 2018-19 school year is entitled to this deduction. Any family with a child attending Purchase Day Camp in 2019 is entitled to this deduction. For the purposes of a Pool Membership, a Family is defined as "Two adults and their children living in the same single family household." Extended family members such as Grandparents, Aunts, Uncles, Nieces, Nephews, etc. must obtain their own membership. Domestic Employees living with you may be added to a family membership for an additional fee of $100.00/Person. Members may invite guests to use the Purchase Pools for a gate fee of of $10/Person on weekdays from May 25th - June 26th, 2019 and August 23rd - September 2nd, 2019, $5/Person on weekdays from June 27th - August 22nd, 2019, and $20/Person on weekends and holidays. Members must be present at the pool and take responsibility for the guest. Purchase Residents who will only use the pool occasionally may swim without a membership and pay the appropriate guest fees of $10/Person on weekdays from May 25th - June 26th, 2019 and August 23rd - September 2nd, 2019, $5/Person on weekdays from June 27th - August 22nd, 2019, and $20/Person on weekends and holidays. The Snack Bar is open on WEEKENDS ONLY. 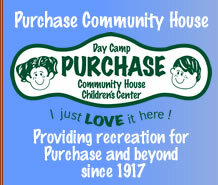 On occasion, the pools will be closed for Purchase Day Camp or Purchase Community House Programs. Up to five (5) days will be impacted throughout the season. Dates to be announced. ELIGIBILITY: Open to Purchase Residents, 2019 Purchase Pool Members, and 2019 Purchase Day Campers. Participants must be going into Kindergarten in September 2019 or older. PROGRAM: A private, one on one lesson lasting 1/2 hour. The lesson is geared to the swimmers' ability. Private 1/2 hour swim lesson times can be arranged for weekdays and weekends from July 8th through August 9th. Instructors will be assigned based upon Lifeguard Schedules and availability. If guards are available prior to July 8th, we may choose to start the lessons prior to July 8th, no promises, but we'll try. This program is only open to Pool Members. This is a limited enrollment offering. REGISTRATION: You must fill out a private lesson registration form and have the lesson confirmed by the Community House office prior to the first lesson. Registration forms are available here and in the PCH Office. Registration forms may be submitted beginning Wednesday, May 1st. No private lessons will be scheduled unless previously approved. Availability of Private Lessons is based upon Instructor/Lifeguard schedule and can not be guaranteed. This is a limited enrollment offering. PROGRAM: A private, one on one tennis lesson lasting for either a full or half-hour. Lessons are available based upon Instructor availability. Scheduled times for lessons will only be available on the following schedule. Tennis Lessons are available from Cathy Moore at the PCH Tennis Court during the times listed below. Tennis lessons on the PCH Court are not available at other times. REGISTRATION: Complete and submit a Private Tennis Lesson Form and return it to the Community House office. The instructor will contact you to arrange dates and times for the lessons according to the above schedule. 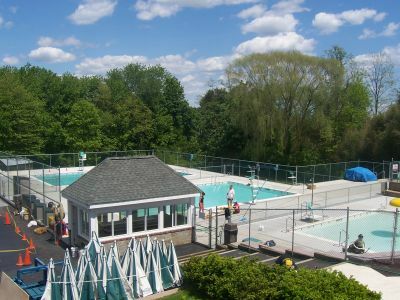 During the camp season the pool opens at 4:15 PM Monday - Friday. The 4:15 opening time helps expedite the dismissal and transition from summer day camp to the opening of the Purchase Pool. It will also minimize the "Parking Spot Wrestling" that pool members have had to endure in past summers. The lower parking lot (next to the pool) is used for camper pick up until 4:15. Both the lower lot and upper lot will open at 4:15 for pool member parking. You're thinking; "But I want to avoid the traffic on Purchase Street and get a parking spot at the Community House so I can pick up my children from camp and go swimming at the pool"
Well, You Still Can! AND you can avoid the traffic on Purchase Street! We will offer a "Pool Pick Up" Program on camp days until 4:45 to all Purchase Pool Members who are also Purchase Day Campers. During this time campers who are waiting for their parents to go to the pool will have a snack and juice break under our Pavilions and then play with their friends on the Volleyball Court. There's no need for you wait in traffic on Purchase Street because at 4:15 both the upper and lower lots will be open for pool members to park. The "Pool Pick Up" Program will make the transition from day camp dismissal to the opening of the pool more efficient, safer for the children, parents and TEAM members involved and give them a positive experience just like they receive at camp each and every day. It's simple, easy and best of all it makes sense! At 4:15, leave Your House for the Community House, park your car in either parking lot, walk to the Pavilion, sign out your children and enjoy your swim. And even more unbelievable…the "Pool Pick Up" Program will be a FREE service to all pool members who are enrolled in Purchase Day Camp.